McClain senior Makenzie Montavon blocks Hillsboro’s Paige Loudin at the net Thursday at McClain High School where the Lady Tigers took on cross county rivals the Hillsboro Lady Indians in FAC volleyball action. 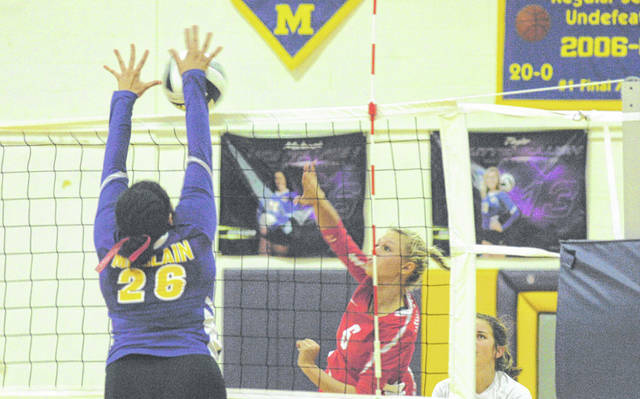 GREENFIELD – The McClain Lady Tigers volleyball team hosted their cross county and Frontier Athletic Conference rivals the Hillsboro Lady Indians on Thursday and picked up the win in straight sets 25-20, 25-17 and 29-27. Despite the straight set victory for the Lady Tigers it was anything but smooth sailing as the Lady Indians had come prepared and made things difficult down the stretch of all three sets. McClain held a commanding 23-18 lead in the first set traded service breaks with the Lady Indians four times down the stretch before finally securing the 25-20 win and a 1-0 lead. In the second set the Lady Indians held the lead until McClain senior Makenzie Montavon took control of the Lady Tigers’ serve and led them to five consecutive rally points including two aces. Later in the set after Hillsboro had tied it at 14 the Lady Tigers broke the serve of the Lady Indians and put together two brilliant rallies for a 17-14 lead. The first rally ended when Cierra Bolender emphatically blocked the Hillsboro spike attempt and the second saw Montavon set up Jaelyn Pitzer for the kill. Montavon was all over the floor for the Lady Tigers as she led them in aces with six, digs with four and had the second most kills with eight. Pitzer led in kills with a total of 11 and was second in aces with four. McClain went on to win the second set 25-17 when Pitzer took control of the Lady Tigers serve and led them to six straight rally points to close the door on Hillsboro for a 2-0 lead in the match. The third set looked to be well in hand for the Lady Tigers as the led 16-8 before Paige Loudin took control of the Hillsboro service game and led them to four straight rally points. Following Loudin ace midway through the run the Lady Indians on the floor and on the bench seemed to come to life as they rallied again to tie the set at 17 after forcing a McClain timeout. From there it was back and forth as the Lady Tigers and Lady Indians took the other’s best shot and refused to go down easily. The set was tied at 21, 22, 23, 24, 25, 26 and 27 before the Lady Tigers were able to earn the two point advantage as Pitzer took a nice set from Kaleigh Easter and spiked it for McClain’s 28th point and then secured the win with the final kill of the match. https://www.timesgazette.com/wp-content/uploads/sites/33/2018/10/web1_Montavon-Block-vs-Hillsboro.jpgMcClain senior Makenzie Montavon blocks Hillsboro’s Paige Loudin at the net Thursday at McClain High School where the Lady Tigers took on cross county rivals the Hillsboro Lady Indians in FAC volleyball action.